Pete Thompson just put out another Edge of the Empire heist, called “Primal Enterprise”. I helped out a bit with editing ad lending some guidance and advice. It’s pretty good! Even if you hate the adventure itself, which you won’t, the maps that are with it are absolutely top notch and worth looking at on their own. Everything then clicked and I jumped into the conversation to disagree. Threats generated on a FFG Star Wars dice roll aren’t so mundane as to be a mere disadvantage, they represent new, previously unseen dangers and obstacles that are introduced. Just like a Move. Just like a Twist. Hence, we come to my scribbled notes for my home campaign; CRUSH the REBELLION – Operation V. In this Operation, the scene was setup as a tense, difficult situation which needed the Agents immediate intervention. I then used fairly punishing difficulties for most activities, usually 3 Challenge dice, and then activated new problems on any result of at least 2 Threat or worse. I had a long list of Complications, such as introducing new enemies or surprise traps laid by a Nemesis, to pull from as I needed inspiration on the fly. The results worked out beautifully, often creating a high-paced, panic-filled environment that never really left the players any chance to catch their breath. It was exactly the style and tone I wanted, and I highly encourage Galaxy Masters to try their hand at this method of adventure design. I’ve received another great guest contribution this week, this time from Peter Holland. 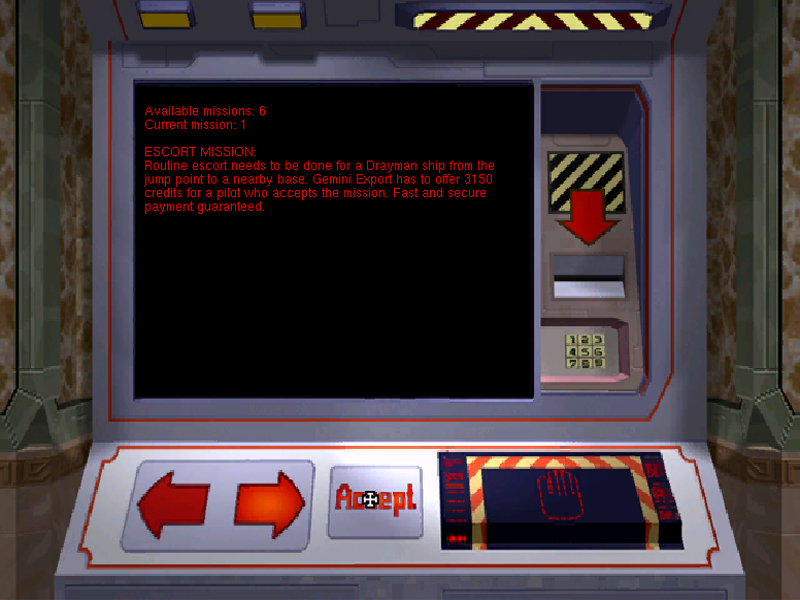 Peter gives us a sampling of a Heist Dashboard he has created for his home group, a clever little PowerPoint Presentation file that interactively allows the Crew to review their current heist options, peruse various details, and select their next impetus for adventure. I think this is a great idea, and brings nostalgic memories back to me from playing Privateer as a kid. As an adult in the 21st Century, I look forward to hearing from the computer-savvy Triumph & Despair readers who take this idea and create their own interfaces, similar to this, for their own groups. As I’ve talked about before here, this is a great jumping point for creating meaningful choice; presenting the players with transparent information, allowing them to make informed decisions on the course of the campaign, and holding them responsible to both the rewards and the perils of that decision. My Crush the Rebellion campaign continues on at full blast. This past Sunday, we had an amazingly fun session that had players enraptured and eager to jump into the narrative to describe their cunning plan. Here are my scribbled notes and lessons learned. Fane of the Sith Lords is a site-based adventure for use with the FFG Star Wars roleplaying game (Edge of the Empire, Age of Rebellion, Force & Destiny). 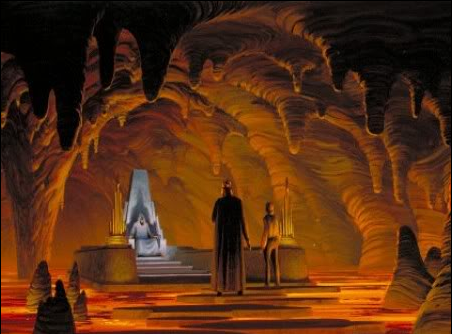 In this scenario, the Rebel Alliance strikes out at The Emperor in his one brief moment of vulnerability, sending a team of assassins into his den of twisted evil where they must treat with the dark horrors of the ancient Sith. Fane of the Sith Lords is like no other Star Wars adventure ever published. It goes beyond the realm of the normal and into the surreal. It pushes the envelope of what is and is not Star Wars, challenging your perceptions while at the same time creating a superlatively difficult game. Fane of the Sith Lords has been dubbed a “tournament module“, eschewing continuity and in-game logic in favor of maddening puzzles, nightmarish threats, and extreme roleplaying game design. Fane of the Sith Lords is not for the timid or faint of heart. It is a brutally punishing adventure that rewards fast, smart, creative play and murders characters who act foolishly or indecisively. I’ve long held the belief, here, that by analyzing a simple flowchart of an adventure in a roleplaying game one can quickly deduce the level of “railroading” and linear plot devices inherent to that adventure. 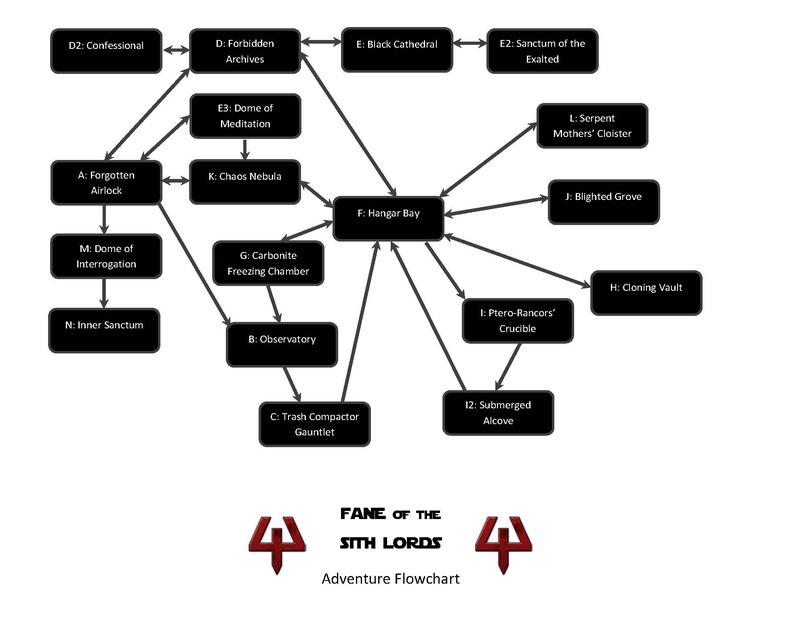 With that in mind, I am very proud to show off a flowchart I created for the upcoming Fane of the Sith Lords Star Wars adventure. This flowchart serves multiple purposes. Firstly, it shows off the interesting, complicated web of potential actions and exploration that could, though doesn’t necessarily have to, occur within the advneture. All of these criss-crossing lines represent many meaningful choices that the players must make, each with their own major impact on how the adventrue unfolds. Secondly, I am proud to show off the stunning, evocative place names within the adventure. My hope is to further whet the appetite of the Star Wars RPG for this coming adventure. Who wouldn’t want to delve into the mysteries locked away in the FORBIDDEN ARCHIVE? Or shake in terror when trapped in the PTERO-RANCOR’S CRUCIBLE? Lastly, this flowchart serves a very practical function for the Galaxy Masters across the globe who will be running this massively detailed and intricate adventure. Knowing which spaces connect to other spaces and where those connections are one- or two-way, is vitally important. The flowchart is an invaluable aid to running a smooth, seamless adventure at the table, allowing Galaxy Masters to focus on their delivery and presentation by cutting down on confusion as much as possible.